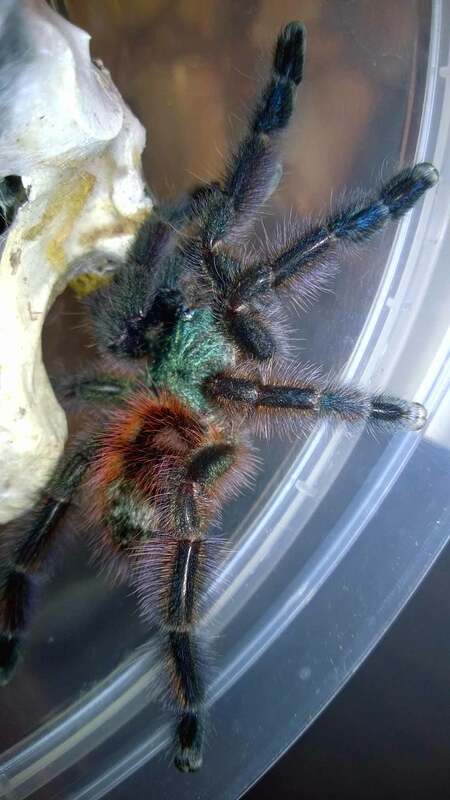 Despite being very common and established in the hobby, there is perhaps no tarantula available right now, save maybe the T. blondi, that causes owners more stress over the husbandry than the A. versicolor. 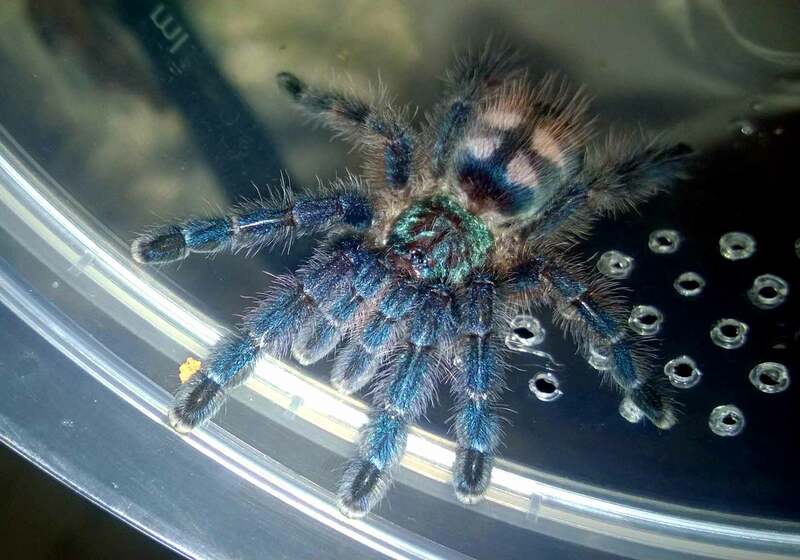 When I first got into the hobby, I was immediately amazed by this gorgeous arboreal, which starts as a stunningly-blue sling and morphs into a fuzzy, multi-colored adult. However, my research into its husbandry proved to be frustratingly confusing and contradictory. On one side were the keepers that said this species was difficult to keep due to strict humidity requirements. On the other side were folks who argued that humidity was not as important as good cross ventilation, and that a stuffy, humid cage would prove to be a death sentence for this animal. Then, there was also the constant mention of SADS, or “Sudden Avic Death Syndrome”, the name of the phenomena where a seemingly healthy Avicularia (often a versicolor) suddenly dies for no apparent reason. The message boards were rife with stories of these little blue spiders curling and dying suddenly and without an obvious cause. Although these reports made me a bit gun-shy to try this species, I eventually caved and picked up a .75″ sling from Jamie’s Tarantulas. It’s been almost two years since I acquired my Versi, and I’ve found her to be a very rewarding tarantula to keep. When I first received my little blue versicolor, I was convinced that this fragile little girl would inevitably perish in my care. 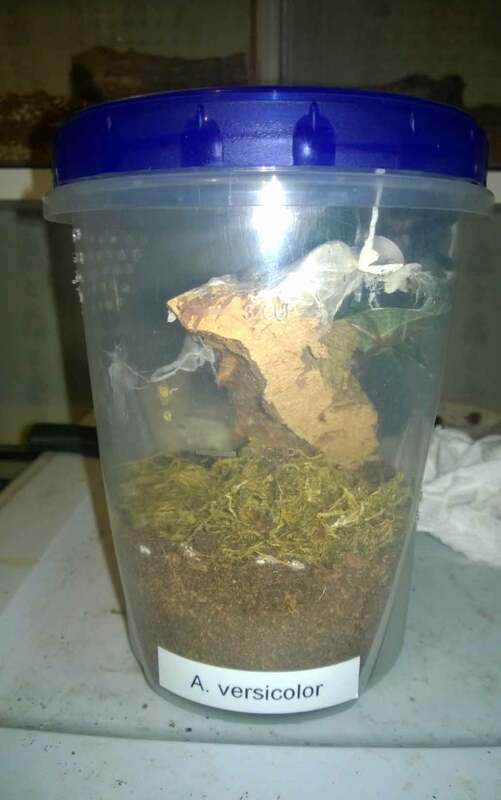 As Jamie had listed this species as her favorites (and had experience with them), I chose to house this specimen in one of Jamie’s Arboreal spiderling enclosures. These clear rectangular cages sported a round 1″ vent in the front and offered good ventilation (although, no cross ventilation). I used about an inch of moist coco fiber substrate in the bottom and a tall piece of cork bark to encourage webbing. 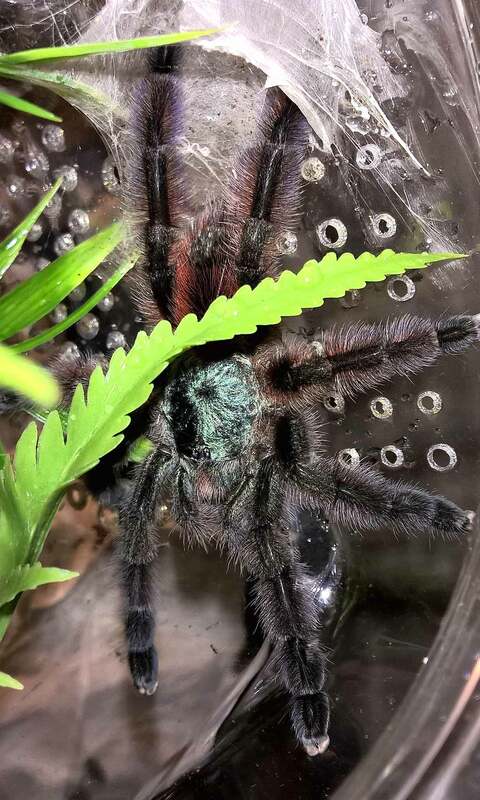 My little versicolor was quick to create a web funnel between the cork and the side of the enclosure, and she spent most of her time in this hide. Now, about that humidity… Although the substrate started off moist, it soon dried out. As time went on, I would moisten one corner of the enclosure by dribbling water on the web and the coco fiber about twice a week (I did not mist). Occasionally, I would see this specimen drink from water on the web. Although I was still very concerned that the humidity wouldn’t be high enough, the little girl seemed to be thriving in these conditions. She ate very well and was molting every two months like clockwork. Even during the winter months when my furnace was bringing humidity down to the teens, she still ate and molted regularly. In my experience, high humidity is NOT necessary for older specimens. In fact, many now believe that stuffy, overly-moist enclosures are a death sentence for this species. Instead, good ventilation seems to be key. Once my avic reached about 1.5″ or so, I added a water dish and stopped moistening the substrate. Now that this specimen is about 3.75″, she is kept on dry substrate with the only humidity provided by her water dish. For temperatures, my A. versicolor was kept between 70 and 76 degrees during the winter and between 72 and 84 during the summer. I did not notice a large difference in growth rate between these two periods. In these temperatures, this species grows at a medium pace, going from .75″ to about 2.5″ in 11 months time. She is now about 3.75-4″ or so, and it was about five months between the latest molts. A modified Ziploc container that I use to house my A. vesicolor juvenile. Holes have been melted into both sides to provide cross ventilation. A piece of cork park has also been provided for a hide. A gorgeous spider with a healthy appetite. As she put on some size, I needed only to drop the item in, and she would eventually locate it. This T has proven to be a veracious eater, taking down larger prey items with ease. Like many of my Ts, this one only refuses a meal when in promolt. She currently feeds on smaller large crickets, and it’s always fun to watch this cute little beauty stalk and take them down. A stunning tarantula and a must for any collection. Although she was quite skittish as a sling, my little versicolor is definitely calming down with age. Instead of bolting into her web when I open her enclosure, she now waits patiently as I drop a prey item in or perform maintenance. 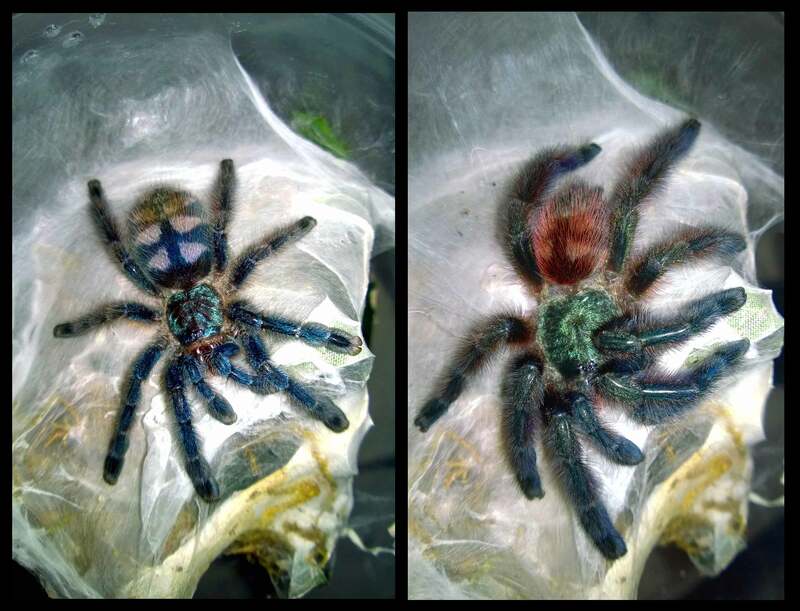 It has also been very rewarding watching the color changes on this specimen as she has molted, and I eagerly await her adult colors. The A. versicolor is a lovely little gem of a species that, with the right care (ventilation!) will thrive and delight for many years. These pics were literally snapped about 12 hours apart. Obviously, there was a molt in between. That sounds like how I currently keep mine! They can be a little more finicky when it comes to husbandry mistakes.